Spinal cord lies in upper two-thirds of vertebral canal extending from upper border of 1st cervical vertebra to lower border of 1st (2nd) lumbar vertebra. 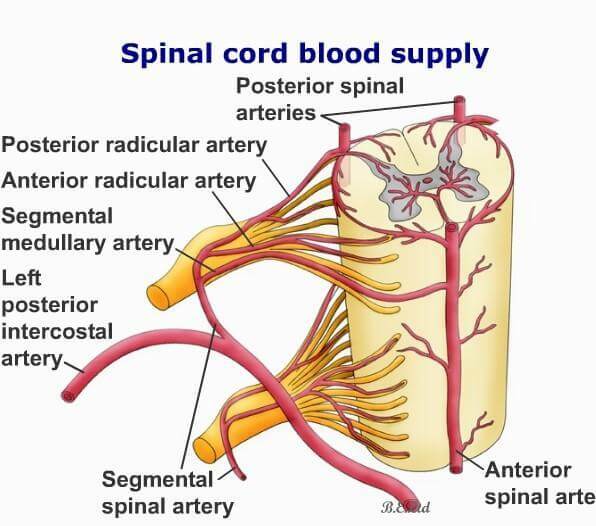 Main arterial channels supplying spinal cord are called spinal arteries. These are three vertical channels, which arise from intracranial part (4th part) of vertebral arteries. After origin, spinal arteries come out of cranium through foramen magnum to enter vertebral canal. These three arteries are: anterior spinal artery and posterior spinal arteries. Inside cranium, each of the vertebral arteries gives out one anterior spinal branch which descends downwards and medially towards anterior median line where they meet each other to form single anterior spinal artery. Anterior spinal artery so formed, runs downwards along anterior median fissure of spinal cord. Posterior gray column with posterior gray commissure. It is already understood, though both anterior and posterior spinal arteries may be existent throughout whole length of spinal cord, anatomically they are slender in different levels. This effect may interfare with adequate blood flow in the affected segments of spinal cord. But it is compensated through reinforcement of the spinal arteries by segmental arteries at every segment throughout whole length of spinal cord. Segmental arteries are horizontal in disposition and enter vertebral canal through intervertebral foramina. Segmental arteries arise from the following regional arteries. In cervical region: Deep cervical artery, ascending cervical artery, and 2nd part of vertebral artery. In thoracic region: Posterior intercostal arteries. In lumbar region: Lumbar arteries, may be supplemented by lateral sacral artery. Segmental arteries enter vertebral canal through respective intervertebral foramen. It then divides into anterior and posterior radicular arteries which approach respective aspect of spinal cord along the route of anterior and posterior roots of spinal nerve. Primary role of the radicular arteries are to supply corresponding nerve roots. But they continue to run further towards the surface of spinal cord for two purposes. They encircle spinal cord from anterior and posterior aspects of both sides and communicate with each other. While doing so, along the length of spinal cord they form a fine arterial reticulum or network called arterial vasocorona. Branches from it directly enter the substance of spinal cord. The radicular artery also communicates with the spinal arteries on the surface to reinforce spinal arteries. This reinforcement is important for adequate blood flow through spinal arteries, particularly below cervical level where spinal arteries are very thin. One of the anterior redicular artery may be very much prominent to take the place of lower two-thirds of anterior spinal artery in case of its deficiency. It is called arteria radicularis magna. Its position is variable from T1–T11 segment.